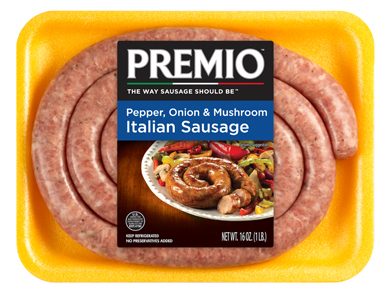 Make your dishes stand out with Premio Pepper, Onion & Mushroom Italian Sausage. With peppers, onions and mushrooms already in this sausage, there’s not much left to add so your meals look and taste great. Satisfying on its own, on a pizza, in a salad, in a dip, on a sandwich or in your favorite recipes, this sausage kicks things up a notch. Ingredients: Pork, Less than 2% of the following: Water, Salt, Sugar, Potassium Chloride, Onion Powder, Natural Flavors (including mushroom flavor), Spices (including fennel & black pepper), Dehydrated Onion, Dehydrated Green Bell Pepper. Stuffed in Sheep Casings. Have you ever shopped for an Italian sausage with peppers at your local market, only to be disappointed with your options? Has the same thing happened when you’ve looked for Italian sausage with onions or Italian sausage with mushrooms? If it has, we can tell you that your grocery store doesn’t carry our products, because our Premio Pepper, Onion and Mushroom Italian Sausage combines all of the ingredients you love in one great-tasting Italian sausage. Do you know what you’re going to make for your next meal? No matter what it is, you should make it even better with our Premio Foods Pepper, Onion and Mushroom Italian Sausage. You can make your next veggie pizza even yummier by using our pepper, mushroom and onion Italian sausage to complement the flavors of your other toppings. If you like meat sauce and want a protein that can take the flavor of your spaghetti sauce to the next level, you can use our pepper, mushroom and onion Italian sausage to do just that. Just remove the sausage from its casing, cook it through in a pan, drain it and add it to your homemade sauce to create something new out of something old and overly familiar. Even if you only have our Premio Pepper, Onion and Mushroom Italian Sausage in your refrigerator, you still have what you need to make a scrumptious, satisfying meal. Cook the sausage using your grill, broiler or skillet and voila! Your next meal is ready for you to enjoy. If you have some thick bread and some parmesan cheese, you can make your sausage into a delectable sandwich you’ll want to last forever. We know our premium products are your best choice because we only use the best ingredients to make them. When you use our Premio Pepper, Onion and Mushroom Italian Sausage to make a meal, snack or appetizer, you’ll know you made the right choice when you taste your creation, because this sausage has a flavor you won’t find in another product. You’ll also know you made the best choice when you decided to cook with our pepper, mushroom and onion Italian sausage when you look at its packaging. We’re proud of the fact that our products are made fresh, without using MSG or preservatives. And if you’re sensitive to gluten, you’ll be glad when you read this sausage’s label, because you’ll see that our Premio Pepper, Onion and Mushroom Italian Sausage is a gluten-free food product. Our tasty and versatile pepper, mushroom and onion Italian sausage is sure to be a crowd pleaser It won’t be long before you’re cooking with the best Italian sausage available. Place your order online or use our store locator to find our products near you!